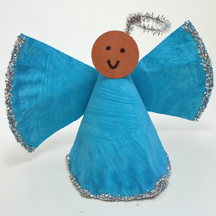 This craft is perfect for a Sunday school activity, Christmas decor or wherever you’d like a see a preschooler-created angel. What You Need: 1 1/2 small (“dessert” sized) paper plates; scrap of construction paper in skin tone of choice; blue (or other color!) tempera paint; circle punch (or just use scissors); silver glitter; 1/2 silver pipe cleaner; black marker; white glue; scissors; tape; stapler (optional). How To Make It: Paint plates blue and let dry. Staple plate into a cone shape (adult job) or use tape. Punch head from construction paper and draw on face. Glue head to top of cone. Cut half-plate into two, creating wings. Glue or staple to back of cone body. Squeeze glue along bottom of dress and ends of wings, or just dip in a tray of glue. Then dip in or sprinkle on glitter. Bend pipe cleaner into halo shape and tape to back of dress. This entry was posted on Sunday, December 2nd, 2007 at 10:19 pm	and is filed under Christmas crafts, paper plate crafts. You can follow any responses to this entry through the RSS 2.0 feed. Responses are currently closed, but you can trackback from your own site.